Redding Paintball, located in Anderson, is a pretty nice paintball facility. They offer paintball, airsoft, and nerf wars, so there’s an activity here for pretty much all ages. Their prices are fair, and they also offer party rates. They have three different party packages from two to four hours in length and for different group sizes. The smallest party package is for two hours and up to six players. The middling package is for three hours and up to ten players. For parties up to 15 people they have a four hour party package. All of these packages are pretty decent deals if you have a group together to go with you. On any of these packages you can add more players for a small up-charge. On their fields they have some frankly awesome bunkers, including multi-level bunkers which are always a blast! They also have a nice Speedball field if you want to get in some team practice, or just prefer it to other field types. If you’re in the area we highly recommend checking them out. Waivers are required for all players. Players under the age of 18 must also get the signature of a parent or guardian. The waiver is available to download on their website. Giant Paintball in Lakeside is a superb paintball park. They have a wide range of games available catering to players ages 7 and up. Along with traditional paintball they offer airsoft and have two versions of Low Impact paintball called Paintball Soft and Paintball Soft 4 Kids. The inclusion of a game for children under 10 makes Giant Paintball a great choice for a kid’s birthday party! Paintball Soft 4 Kids is less painful than traditional paintball, but still fun for all ages! Their prices are fairly reasonable. They offer group rates for all of their games. You can also reserve a private group if you have at least 15 people. Keep in mind that Giant Paintball is a field paint only park, so plan ahead. If you’re a frequent paintball player take a look at their membership. It’s actually an amazing offer if you play often enough. They also offer an airsoft membership. Giant Paintball has a wide array of fields available for play. From bunkers and castles to ravines and woods, plus some themed fields such as Western, and a tournament arena. Giant Paintball really has it all. They also host events occasionally, so keep an eye out for those. Giant Paintball requires all players to sign a waiver prior to play. Players under 18 will also need their parent or guardian’s signature. The waiver can be signed electronically on their website. Located in Fresno is Maximum Paintball. They have a field and a supply store of the same name, both with Fresno addresses, so make sure you set your GPS to the right place! The field is located in the Fresno Regional Sports Complex. They have three smaller fields, including a regulation X-Ball field, a regulation NPPL field, and a concept field. They also have a 4.5 acre scenario field, for scenario events. Their field rates and paint prices are both affordable. Maximum paintball is a field paint only park, so we definitely appreciate the low prices. They offer season tickets for discounted rates on five, 15, or 25 field entries. Buying the 25 entry season ticket will save you 50% off the normal price! Maximum Paintball offers group rates for parties. Minimum of six players for parties on weekends, and 15 players for parties on weekdays. This is a really great place to play traditional paintball! Get your squad together and try it out for yourselves. Signed waivers are required for all players prior to play. Players under the age of 18 must also get the signature of a parent or guardian. Maximum Paintball has two waivers available on their website for download: one for adults and one for minors. We would be remiss not to include SC Village in Corona. SC Village was the first paintball park to introduce Speedball fields, and revolutionized concept fields. They made their mark in paintball history and became famous in the process. That was over two decades ago. Today, they’re still going strong as one of the premier paintball parks in the world. They host numerous ambition events, including crowd-pleasing 24 hour paintball scenario events. They host high-profile tournaments including the NPPL Paintball Tournament, and the PSP Paintball Tournament. With over 100 acres to play on, this place is insane. SC Village offers traditional paintball, Paintball Soft, Paintball Soft 4 Kids, and airsoft. They have a friendly and knowledgeable staff ready to help ensure you have the time of your life. With games for players ages 7 and up, and separating beginner and advanced players in open play, this is a great place to bring your kids, either just for a day of fun or for a birthday or special event. SC Village offers memberships for those who play a lot of paintball. They’re a little pricey, but you do get quite a lot. We recommend the Paintball Annual membership for the best bang for your buck. SC Village is only open on the weekends, though they do take reservations on weekdays. This place is incredible. On their 100 acres they have more than ten fields, with all sorts of terrain and other hazards. We especially loved the plane fuselage; that was a lot of fun. There’s honestly so much to go over, it would really be better for you to see it in person. A historic paintball park that’s still going strong today. Every serious paintball player should check this place out. SC Village requires waivers for all players before entering the field. Players under 18 will also have to get the signature of a parent or guardian. Conveniently, the waiver can be filled out and submitted on their website, no printer required. Davis Paintball is, as the name suggests, located in Davis. Davis Paintball offers several ways to play. Traditional paintball, Paintball Lite, and SplatMaster. SplatMaster is designed for children as young as 8 in mind. Paintball Lite is perfect for new players, or players 9 and up. The lower caliber and velocity of the markers in SplatMaster and Paintball Lite are generally considered for children, they’re fun for older players as well. They have nine fields over their 40 acres. Their paint prices are a bit on the higher side, but their field and rental fees are reasonable. Be prepared to use field paint if you’re planning on renting your marker on-site. They separate beginners from advanced players, so you don’t have to worry about being horribly outmatched. Even teams means more fun for all players! They have nine fields over their 40 acres, including Airball and Hyperball fields, as well as many themed fields with some really fun bunkers and hazards. Davis Paintball also hosts events. They have a couple monthly events, including scenario days. Definitely take a look at their upcoming events on their website. Davis Paintball is a great paintball park, and well worth checking out. All players must sign a waiver prior to play. Players under the age of 18 will also need their parent or guardian’s signature. The waiver is available for download on their website. Gladiator Paintball Park is located on the National Guard Base in San Luis Obispo. They don’t technically have an address because of this, so don’t try to use your GPS to find them. Instead, check out the directions on their website. Although finding it the first time requires some planning on your part, it’s well worth it, and though it sounds like a chore it’s really a minor effort. Their prices are very affordable. Along with traditional paintball they also offer Splatterball for players as young as 8, and Nerf Wars, for players as young as 5. Nerf Wars is great for kids’ parties! They have nine different playing fields, plus one for Nerf Wars. They offer Speedball and Hyperball fields, which is always welcome. Their Urban Village and Junkyard fields are awesome. But what you really have to check out is the Von Zipper field! It’ll take brilliant strategies to pull off victory there. If that’s not enough they host scenario events, like Zombie Hunt, on occasion. Overall, a versatile and extremely fun paintball park, definitely worth visiting. At Gladiator Paintball Park a signed waiver is required from all players prior to play. For players under the age of 18 the signature of a parent or guardian is also required. The waiver can be filled out electronically on the website. Paintball Wars paintball park in Palmdale (say that five times fast) is a great place to play some paintball. Their staff is exceptionally friendly, takes safety very seriously, and makes sure everyone has a great experience. They cater to both new and experiences players with a focus on fun and safety for everyone. They have three Rec-ball fields with bunkers to play in. Their prices are very fair, and they have some great equipment available. They even offer single-use camo overalls for purchase, as well as camo rentals which are laundered after each use. They do require field paint for use in their rental markers, but if you’re bringing your own marker you’re free to use your own paint as well. They’re typically open only on the weekends for open play. However, you can book a time slot during the week for private parties. Although compared to some paintball parks it might seem on the smaller side, it’s got a good following and draws just the right amount of players so it’s not crowded. Paintball Wars is an awesome paintball park overall. Get your buddies together and go check it out. Paintball Wars requires signed waivers from all players. Players ages 10-17 will also need the signature of a parent or guardian to play. The waiver is available to download from their website. A great park for some serious fun is Capital Edge Paintball Park in Sacramento. Capital Edge Paintball ensures all players a fantastic experience by separating players with rental equipment and players who bring their own. Furthermore, they have intermediate and advanced groups for players with their own equipment. This way no one has to play against opponents who seriously outgun them or have significant differences in skill. Their paint is a little bit pricey, but their field and rental fees are more affordable. If you’re planning on renting your marker, they require the use of field paint, so plan accordingly. If you have your own marker, you can bring your own paint. However, they have a few select brands which are banned from use on their fields entirely. Make sure you check out their banned paint brands on their website’s rules page. Capital Edge Paintball has eight awesome fields, plus a special field for SplatMaster games. The bunkers and hazards on their Urban Scenario field and Village field are especially phenomenal. For younger fans of paintball, Capital Edge Paintball offers SplatMaster. SplatMaster uses lower velocity and smaller caliber to create an even less paintball experience. It’s best for ages 8-12. Note that for SplatMaster a group reservation is required, so plan ahead! Capital Edge Paintball has something for the whole family. It’s great for birthday parties for younger kids and teens alike. Serious paintball players and casual players will all have a great time. Do yourself a favor and check out Capital Edge Paintball. Signed waivers are required for all players. Players under 18 must get the signature of a parent or guardian. The waiver is available for download on their website. Located in Santa Paula is Stryker Paintball & Airsoft. In addition to traditional paintball you can tell by the name alone that they offer airsoft as well. However, it’s definitely worth noting that they have SplatMaster paintball for ages 7 and up. Traditional paintball is only for ages 10 and up, and not every paintball park offers games for younger players. SplatMaster is easier for kids, with the lower velocity and smaller caliber making hits less painful, but it’s still great fun for all ages. Stryker Paintball & Airsoft offers several fields for play, including Airball and Hyperball fields. They also have a Western Town field and the super fun Gridiron field. Their paintball fields have some fun bunkers, and low cover obstacles for ducking behind. Stryker Paintball & Airsoft has reasonable field and rental rates so you won’t break the bank. They’re open weekends normally, weekdays by appointment only. Stryker Paintball & Airsoft is a great place to celebrate a birthday for younger kids, teens or adults. While paintball may be divisive for some corporate parties, Stryker Paintball & Airsoft is actually the perfect paintball park for a corporate party. They’re right next door to Mountain View Golf Course, and have a partnership with their neighbor. This means any players in a corporate party who would rather opt out of paintball can go enjoy some relaxing golf instead. You won’t see an offer like that at any other paintball park. Waivers must be signed by all players prior to play. Players under 18 also need the signature of a parent or guardian. The waiver is available to download on their website. 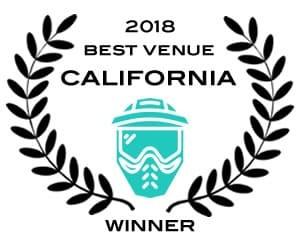 American Paintball is located in Livermore. Ironically, red, white, or blue paint is not allowed on site, along with pink paint, Midnight paint, and Impact paint. They also only allow HPA, so no CO2 tanks. American Paintball is a great little paintball park. They have nine fields over their 6.6 acres and promise a challenge for beginners and experienced players alike. Their range of fields include their Spools field, Back Diamond field, the super fun Door field, Attack & Defend field, and their Four Corner field, plus more. Their facility is equipped with equipment cleaning stations, shaded staging areas, concessions, plus a Chrono area and shooting range. Their prices are mostly very fair, with one or two things leaning to the slightly pricey side, but not so much that it’s unreasonable. We definitely recommend taking a look at their private party options. While they are normally only open on the weekends, they accept weekday reservations for private parties. All private parties with groups of 10 or more include masks for the players to take home. Possibly the first piece of their own set of equipment, and a memento from an exciting day of paintball! In addition to paintball, they also offer laser tag. Plus, their laser tag is portable, so if you want to book a party they can bring the equipment to you! American Paintball is one park you won’t want to overlook. All players are required to sign a waiver prior to playing paintball. Walk-on players must be 12 years of age or older. Players in private parties must be at least 10 years of age. Players under 18 will also need the signature of a parent or guardian to play. The waiver is available on their website for download.